This one is dee-licious. 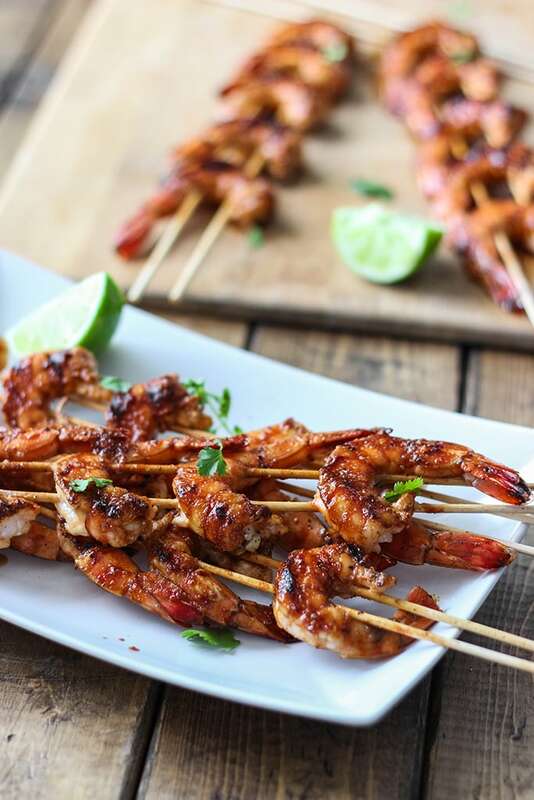 With the same, much loved flavor profile of honey garlic shrimp, we get to enjoy everyone’s favorite sauce with boneless, skinless chicken thighs or breasts. It’s simple to cook, quick and easy, but full of yum. And it’s 20-25 minutes (depending on the thickness of your chicken) from prep to table without lacking in flavor. Great for those quick weeknight dinners. Don’t worry about all the shiny stuff on the pan that looks like oil. It’s actually the sauce. Loads and loads of sauce! This is the stuff that’ll give your chicken that wonderful glaze. 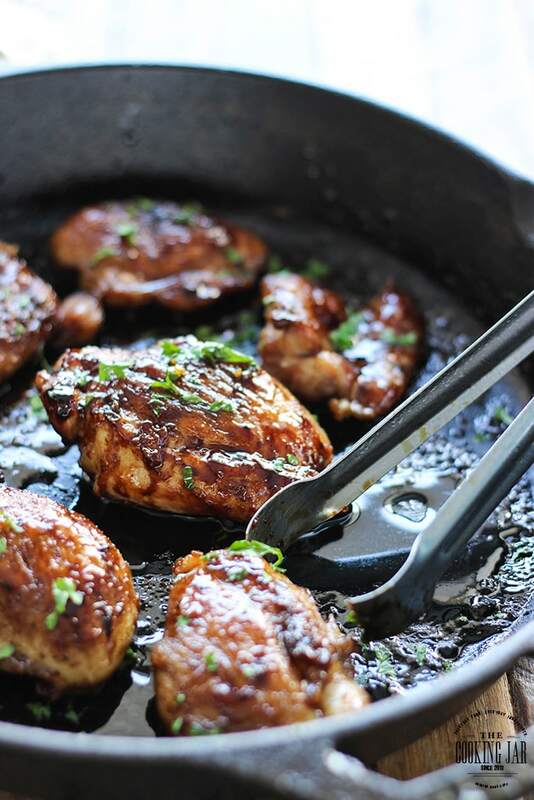 I used boneless, skinless chicken thighs because I feel they are juicier but if you prefer chicken breasts, this will work too. There’s only five ingredients here and it should serve around four with some sides. Try it with some greens (asparagus, broccoli, zucchini, green beans) or chop it up and toss it in a salad. There’s plenty of ways to enjoy this. So let’s begin. One pound of boneless, skinless chicken thighs turned out to be about four thighs for me. So if you sub with chicken breasts, go for one pound’s worth. Halve the thighs to make them cook quicker and cook them in two batches so you’re not overcrowding the pan. This also makes sure the chicken browns better instead of steaming. If your breasts are slightly on the thicker side, it might be worth it to slice it up in the middle as well, to cut that thickness in half so it’ll cook faster and more evenly. Also make sure the thighs/breasts are dry before we cook them so they brown up nicer (and so you don’t get attacked with angry, spitting oil). 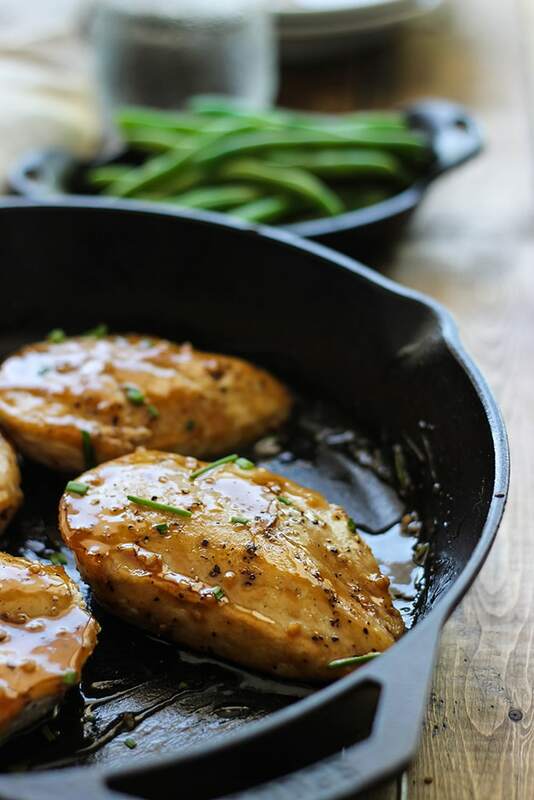 Start heating up the pan over medium high heat in a 10″ skillet to sear and cook the chicken. I used about two tablespoons of oil, just enough to coat the bottom of the pan. 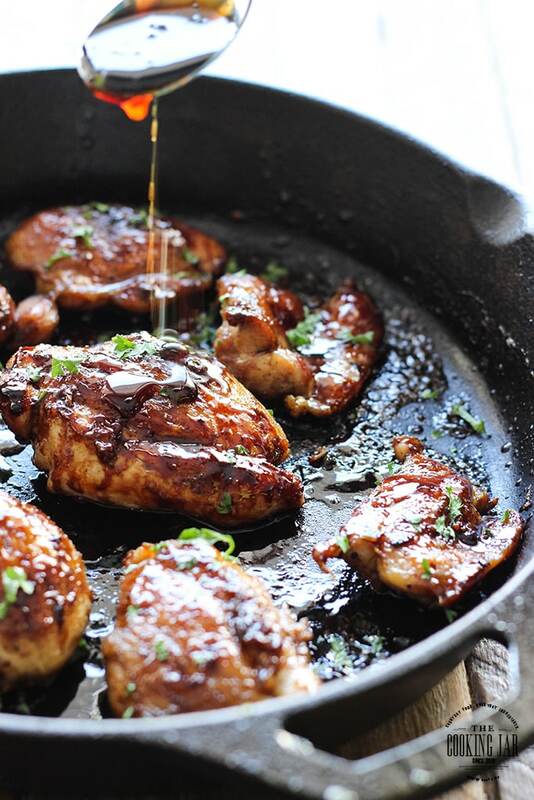 Since there isn’t any skin on the chicken to render fat, we’ll be relying solely on the oil you add to the pan. It should take about 3-4 minutes to sear and cook each side, depending on the size. The smaller pieces will end up crispier than the bigger ones. Watch out for them and remove them from the pan earlier if needed. After the first side of chicken is done, reduce the heat to medium to stop the pan from smoking before flipping the chicken over. You will be cooking from medium to medium-low heat from here on out. Even though we patted the chicken dry with paper towels earlier, there might still be some angry spitting from the oil. So it’s always worth it to invest in a splatter guard. And wear an apron! Once it’s all cooked, drain the chicken on some paper towels and remove any excess oil from the pan. Reduce the heat to medium-low. Mix your sauce ingredients, toss the chicken back in and pour the sauce over the chicken. Make sure to keep the heat on medium-low as boiling the sauce too fast will burn and harden it into a sticky mess. And even though sticky sauce sounds great, burning it changes the sweetness of the honey to bitterness. It’s not too tasty. You show a very lovely picture of thighs, and glaze, and something green and leafy. There’s nothing green and leafy in the ingredients. LOL. It’s just some chopped up parsley that’s not needed for the flavor profile. I added it to make the pictures ‘pop’ instead of plain brown chicken, you know? Purely optional and more for presentation. I just made these for the family last night. It was easy peasy and so dang delicious! 😋 Thanks for sharing. This recipe is definitely a keeper and one that will be rotated into my repitoire of regular meals. Very good sauce and so easy to make. I took the base recipe then added some cornstarch mixed with a little pineapple juice and thickened it slightly to go on some deep fried wings. Yum! My 11 yo daughter told be I’d better make this again! Thank you for the recipe! Oh that sounds delicious! I love the addition of pineapple juice to it. Great idea to thicken it and toss it with some wings! I cannot stop my mouth from watering. 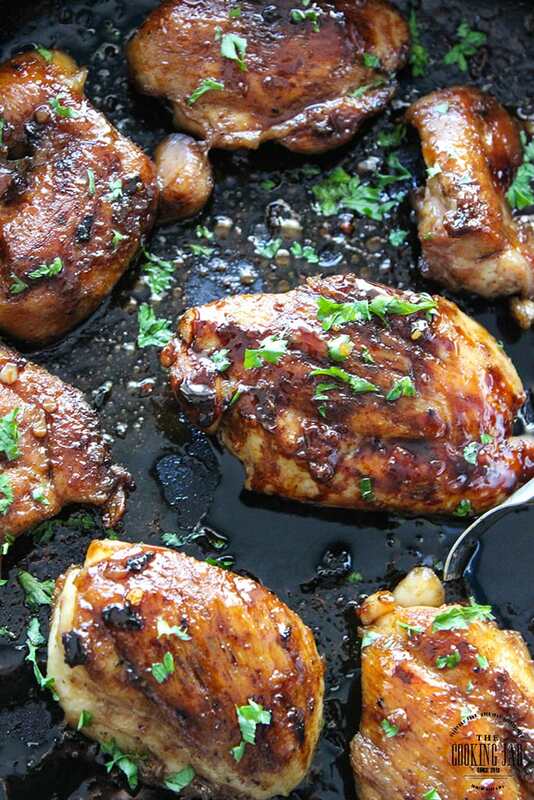 These look so juicy and full of flavor and so stinking perfect for those busy weeknights! “Stinking perfect”. Hahaha! Thanks for saying so, Karly! This receipe was amazing! My kids loved it, I personally am a onion fan so I sauteed onion & garlic. Which gave extra flavor, thanks a lot for this, I am a single mother so anything to get my kids excited about dinner. I love onions too! I try to keep the recipe basic for those that wanna stay simple but it’s always an option to jazz it up a little with a little this and a little that. This would taste lovely with caramelized onions. I’m super glad to help you guys with dinner! Your photos are beautiful! Your meals look fantastic. Thank you so much, Kim. Happy cooking! This chicken looks yum,i can’t wait to cook it. Thanks for this great simple recipe. I loved it! I did it with skin on / bone in chicken thighs, and tasted great. However, I wasn’t so sure what side dishes would go well with honey garlic chicken. Any suggestions? Yum! Love crispy skins. Just gotta be careful to make sure the chicken thighs are fully cooked and to adjust the time accordingly. Bone in tends to require more cooking time. Wouldn’t want you to get ill! As for sides, I will always advocate some greens. 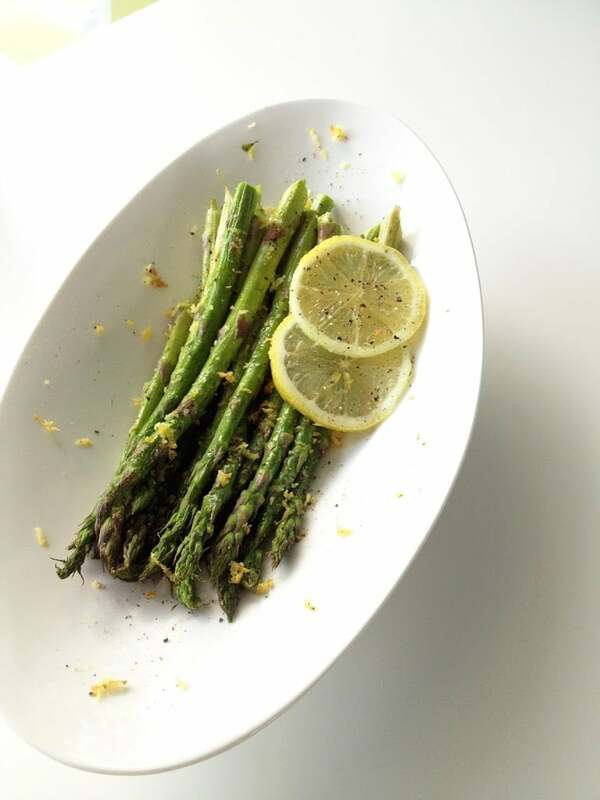 Seared asparagus or green beans in garlic. Keep it simple so the chicken flavor can shine. If you’re fine with carbs, maybe some mashed potatoes, hasselback potatoes or steamed rice. If you’re going with rice, theme it with Asian-style greens. Hope this helps! I love your recipe but I want to serve to my children and grandchildren. The total servings are 19 ?. Would I ruin your recipe if I baked the chicken (maybe broiled for a short time)? That’s a huuuuge serving size. So I guess doing it all in a baking tray makes more sense. You can bake it just fine as long as you adjust the cooking times to accommodate the change of cooking method from searing to baking. Baking usually takes longer. 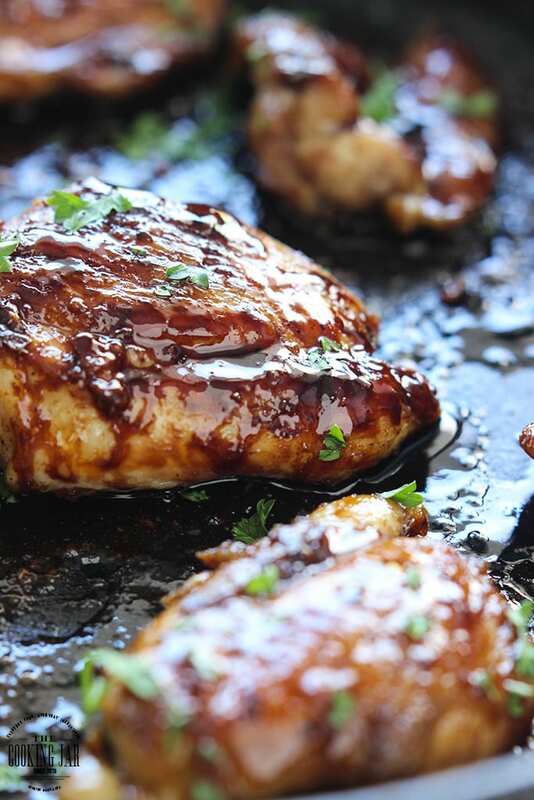 I would suggest dividing the sauce into half, marinate the chicken with half of the sauce and using the other half to baste the chicken before broiling it to finish it off. 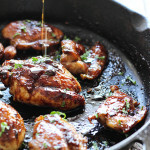 I’m thinking of making this delicious looking dish, but am wondering if I could substitute Agave Nectar for the Honey? Heya Andrea! Yes, you absolutely can. I have some agave nectar I use to substitute honey or sugar now and then. Good luck! Great recipe! So simple and so tasty. I tried it tonight and I think I’ll add it to my rotation. Thanks for sharing! Thanks for trying it out, Jules! Happy eats! Hey, Annie! Thanks for trying it out. And I have to say, out of the three you mentioned my fave would have to be the cilantro and lime. I’m pretty sure I ate that whole pound all by myself. Worth it. Make sure to be liberal with sprinkling more lime juice while serving it! Ahh, talking about it brings such good memories and now I’m drooling. Do you need pound the chicken? I didn’t pound mine but if you have a particularly large and uneven chicken breast, you can opt to pound it so it cooks evenly. Good luck, Marina! i was really excited about this recipe. Had to breasts and used them instead of thighs. Also was just using 2 halves. but i wanted all the sauce so made the full recipe. wellllll I hardly had enough sauce for us. Thanks for trying it out, Susan. If you want more sauce, you can always double the sauce ingredients. 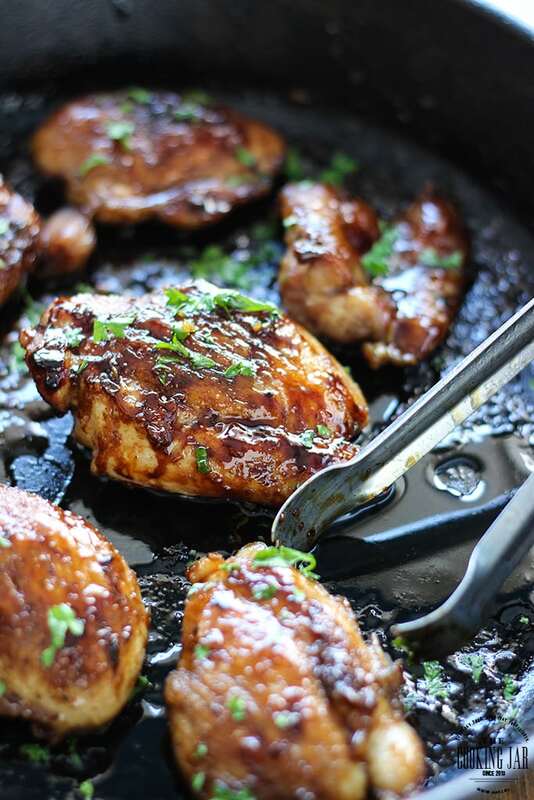 It’s not a super saucy chicken dish to start out with so if you’re the kind that loves a lot of sauce, I would recommend doubling it to begin with, then reducing it to the desired thickness. Had been looking for a skinless, boneless thigh recipe for 2 days and decided to try this after getting off work and not wanting to spend a great deal of time in the kitchen…wow!!! really loved it. I will be sharing with my friends at work tomorrow. This will be my go to dish when in need of a quick meal. Thanks for the fantastic dish. You’re very welcome, Linda! I’m glad it worked out for you with minimum fuss. And I’m always happy to help someone find a new quick and easy staple, especially after a tiring day at work! Farah! I just stumbled onto your blog page in a google search looking for chicken thigh recipes! I’m so happy to see this page has taken off for you in such a big way!!! I am going to make this recipe in a few minutes- it looks so good and SO easy!! Hope you and your hubby have been doing well! Congrats again on your awesome success. I can’t wait to go back through and get tons more recipes from your blog!